You can definitely do the 21 Day Fix on a tight grocery budget without question. This post contains the lower cost food options available to you on the 21 Day Fix, plus a few of the tips I’ve learned along the way to saving money on healthy foods. I included food prices to give you a general idea of what items are going to cost. However, this will vary depending upon where you live and the time of the year. Good old supply and demand determines a lot of the prices you will see below. 1. Plan your meals for the week, then go shopping. Use all of the food you bought for your meal plan for the week. This will help eliminate waste. 2. Know your prices. Prices on foods can vary greatly especially with online retailers. Specialty foods like the seeds and oils can often be found for less online, which we will cover below. Lots of veggies can be purchased for less when they’re frozen. Think you’re not packing as much nutrition with frozen? According to some studies, frozen veggies contain as many, if not more, nutrients than fresh. 21 Day Fix wants you to try to avoid canned. Due to the high heat used in the canning process of veggies, nutrients like Vitamin B and C might be lost during the canning process. If you do decide to use canned fruits or vegetables, be sure to check the ingredients for any added sugars or salt – something you want to avoid. If you want to get the lowest priced and best tasting fruit, try to buy your fruits seasonally. Eating seasonal fruit will also help you to buy from local farmers, which can help your community and be more environmentally friendly than fruit that might come from another country. Vegetable and fruit prices can vary greatly depending upon where you live. The numbers above were taken from the United States Department of Agriculture’s 2015 fruit and vegetables prices study. My money saving tip for the red 21 Day Fix container might sound a little odd, but it is a great way to save money. Look for reduced-priced meat offers. Grocery stores will often sell meats that are about to expire for heavily discounted prices. Just be sure to use immediately or freeze before they go bad. Many of the dried goods for the 21 Day Fix yellow container can be purchased from bulk bins. Stores will pass the savings of not having to pay for packaging right along to you, which is a great and super easy way to save. 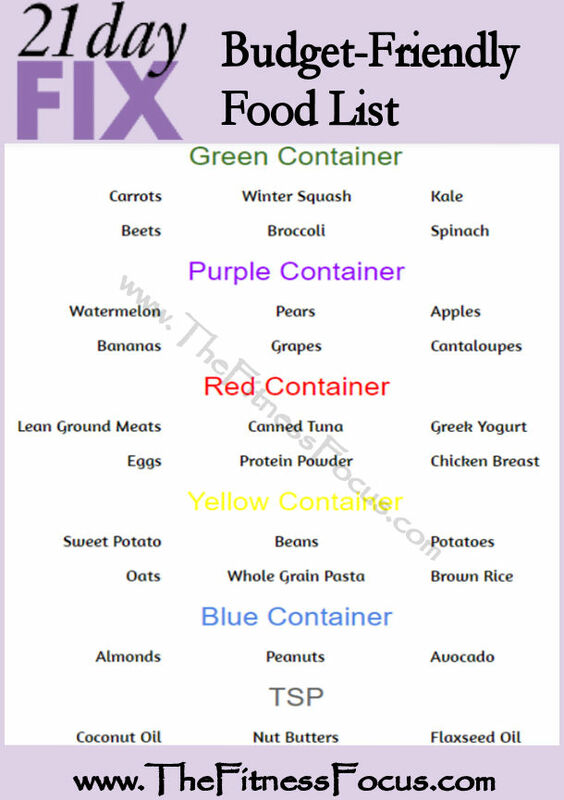 Like the yellow container, the 21 Day Fix blue container foods can often be purchased in bulk. Nuts do have shelf lives, so be sure not to buy more than you can eat in a certain time frame. Typically, I purchase for the week only. Online retailers like amazon.com are often cheaper for some health foods than grocery stores. Knowing your prices and stocking up when you can is the best way to save money in this category. The tsp from the 21 Day Fix are likely the most expensive container up front. The good news is that for these items, you get many servings. For example, 1lb of coconut oil is 101tsp, making it go a very, very long way. Do you have any money saving tips for the 21 Day Fix or budgeting for the 21 Day Fix, in general? Please share in the comments below. What is the Beachbody On Demand All-Access Annual Pass?